Home Workouts And Exercises Common Pushup Mistakes – How To Correct Them: VIDEO! Common Pushup Mistakes – How To Correct Them: VIDEO! Push-ups are one of the best body weight exercises that can build an incredibly solid foundation. If done, without pushup mistakes, they will strengthen your upper body, and give you a great physique including solid chest and arms. But I have noticed that the majority of people perform push-ups in a wrong manner. Most people do the same mistakes when they do push-ups. Here are 9 things you should know so as to avoid the pushup mistakes and do a perfect pushup in its correct form, read on! Watch the video below, read the accompanying tips, and and learn how to do a perfect push-ups today! Majority of the people position their hands too wide and/or too far forward. This entails more stress on your shoulders, and you are unable execute pushups with your full strength. Correct Form: Make sure that the heel of each palm is directly under each shoulder or just a little bit wider than shoulder-width apart. This ensures a solid support for the pushup without putting undue pressure on the shoulder joints. This is an outcome of incorrectly placed hands. Some people have wrong notion that a pushup is supposed to form a “T” shape with your arms jutting out at 90-degree angles from the body. Flared elbows put additional pressure on the shoulders making them prone to dislocation. Many people have the tendency to press their hips up toward the ceiling while doing push-ups, making a pyramid like structure. People tend to do it because it’s a cheat move that makes pushups easier by requiring less core engagement. 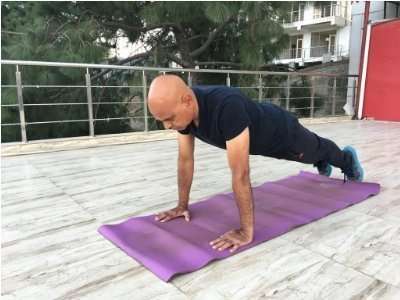 You should move your body in a straight line while executing the pushups, without your body looking like an upside-down ‘V’. This can happen in many ways, but the most commons are the tendency to drop rear your head. I notice this mistake quite often when people are deficient in pushup strength — they tend to drop their head to feel, as they’re getting closer to the ground. Actually, it can strain your neck, not helping in any way to gain upper body strength. Correct Form: Focus on maintaining your neck entirely neutral, with your eyes looking toward the ground, to help avoid yourself from looking up. When you don’t have core strength to execute standard pushups, your lower back tends to sag. And if let your lower back sag, this can lead to an unfortunate trigger of lower back pain. Correct Form: If you have poor core strength, begin with doing inclined pushups and as your core strength builds-up – then progress to standard pushups. And if your core strength is ok then you can fix this mistake by tightening your glutes and legs. Recruiting your glutes will help keep the lower back from sagging or arching during the move. This is another most common mistake! People often do incomplete pushup. They just hang out at top of the exercise, and performing little “pulses”, while believing they are executing full range pushups. Correct Form: A perfect pushup full rep involves a perfect plank, and bending your arms to 90-degrees and straighten them back fully. Going all the way to the ground and making your chest touch the floor, and then straightening your elbows in a full plank is a full range pushup. Slow, full range of motion pushups increases your strength and stamina, and will benefit you far better than 50 small pulses. Pumping out fast pushup reps, using as much momentum as possible is the wrong way. This makes you lose control in maintaining proper form of doing pushups. Correct Form:Focus on quality than the speed. Keep control on the lowering phase, while breathing consistently throughout the full range of motion, and exhaling forcefully as you push yourself up. Thinking pushup is meant only for building chest and triceps strength is the wrong perception – meaning on the one hand you are not securing it’s full benefits and on the other exposing yourself to the risk of injury. Correct Form: Pushup exercise needs to engage your entire anterior chain, from your quads & core to your shoulders & chest, and at the same time requiring additional involvement of your back & glutes to stabilize your body. A major pushup problem is often people tend to lose control of their shoulder blades. You need to keep the shoulder wide to ensure that your shoulder blades neither stick up, nor wing out of their backs. Correct Form: Inhale as you lower your chest toward the floor then exhale while you push up. This keeps a steady supply of oxygen to fuel movement, which will help you execute the pushups to the best of your ability. It’s important that you perfect pushup form. A perfect pushup not only enable you gain the strength of your chest, shoulders, and triceps faster, but also make your core stronger because you need to hold perfect plank while executing each pushup. Learn here the perfect form of standards pushup. Go for quality with (correct form) over quantity. While chasing quantity, the form tends to suffer. As the bad form takes over, you stray away from effectively engaging the muscles the exercise is designed to recruit — and also increasing the risk of suffering an injury.